Atheism, once confined to the margins of civilized debate, has grown militant and mocking – often characterizing Christianity as foolish, dangerous and evil. Nowhere is atheism’s unprecedented recognition more evident than the celebration of “Darwin Day,” with over 500 events planned worldwide to honor Darwin’s 200th birthday and the mainstream media lauding him like a saint. Why is Darwin so important to atheists? Because Darwin devised, for the first time in history, a way to explain Creation without the need for a Creator. Like a theory allowing people to sit in a Cadillac showroom, surrounded by dozens of sparkling new cars, and yet deny that the cars had a maker, so did Darwin bequeath to the human race a clever way to deny what up until then had been undeniable – the self-evident reality of God the Creator. 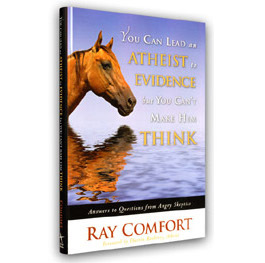 In You Can Lead an Atheist to Evidence but You Can’t Make Him Think, Ray Comfort uses a lively Q & A format, based on actual questions from atheists on his blog at “Atheist Central”, to lay bare the weakness of the atheist’s argument, but he does so with good-natured humor and warmth. Indeed, few authors have appealed so passionately to the atheist’s conscience. Comfort does much more than outline powerful empirical evidence of God’s existence; he reveals to atheists how desperately they need His love and forgiveness. A new breed of militant atheists aims to eliminate Christianity. Believers need powerful weapons to “fight the good fight of faith.” Whether you’re answering an atheist at the office or reassuring your child after his faith comes under assault in the classroom, you need to have this important new book. God’s existence is easy to prove – and this book teaches anyone how to do it.